Warner Music Group is now a proud member of the $1bn streaming club. The company announced today that its recorded music operation generated $311m from the likes of Spotify and Apple Music in the three months ending December 31 last year. That figure, up 47% year-on-year, was enough to take calendar year 2016 streaming revenues across the firm’s labels to $1.007bn. In the final quarter of 2016 (Warner’s fiscal Q1), therefore, WMG’s recorded music division was earning $26m a week and $3.4m a day from streaming. As reported by MBW, Universal Music Group was the first major to see its recorded music operation surpass $1bn in annual streaming revenue, back in December 2015. Meanwhile Sony Music, hampered by the strength of the Yen against the Dollar, posted $1.2bn from streaming in calendar 2016. 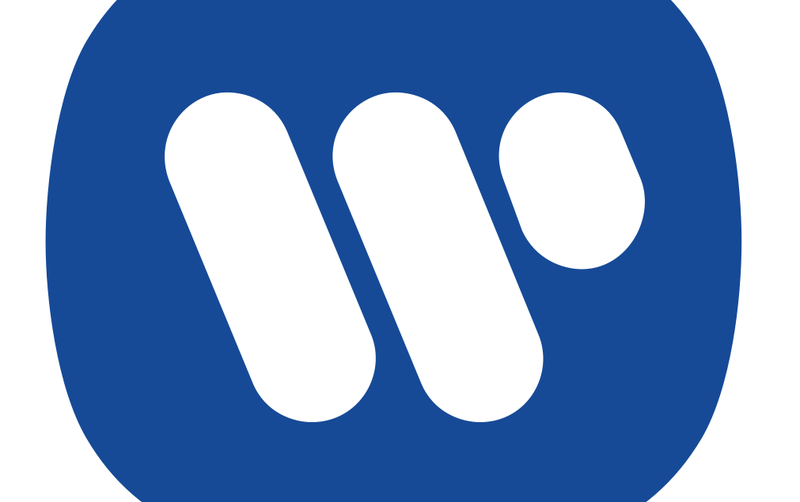 Warner’s total recorded music revenue increased by $60 million to $797 million for the three months ended December 31, 2016. That was up 8%, or 11% at constant currency. 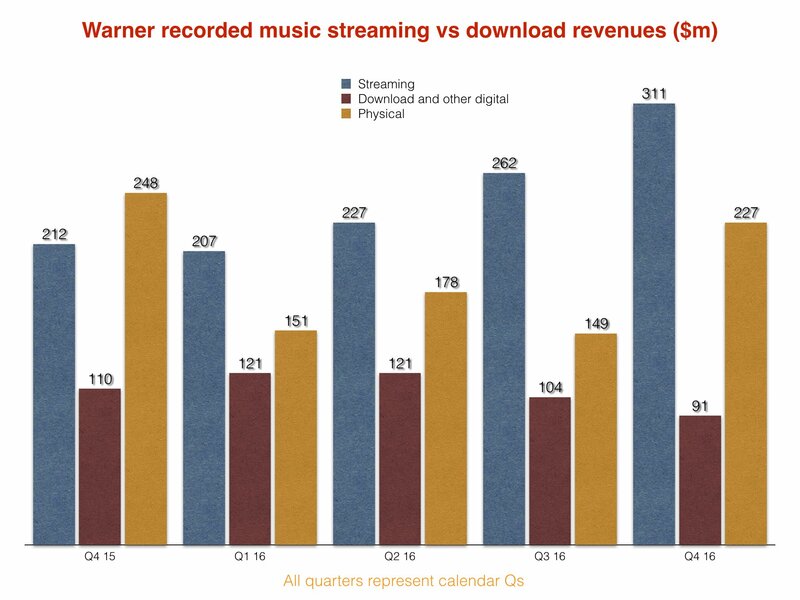 Streaming’s $311m contribution made up almost 50% (49.4%) of total sales and streaming revenue within this figure ($629m), with physical sales claiming 36.1% – a smaller proportion than you might expect for the Christmas ‘gifting’ quarter. ‘Download and other digital’ were responsible for the remaining 14.5% of the quarterly sales/streaming total, with $91m in total. It’s interesting to compare these stats to Sony Music’s equivalent figures for the final quarter of 2016. Streaming contributed 39.9% of Sony’s recorded sales/streaming revenues in the period, but physical was much more prominent with a share of over 40%. Other quarterly recorded music revenue sources at Warner in its Q1 included licensing ($74m, -7% YoY) and ‘artist services and expanded rights’ ($90m, +8% YoY). Warner’s major sellers in the period included Bruno Mars (pictured), Michael Bublé, twenty one pilots, the Hamilton original cast album and the Suicide Squad soundtrack album. 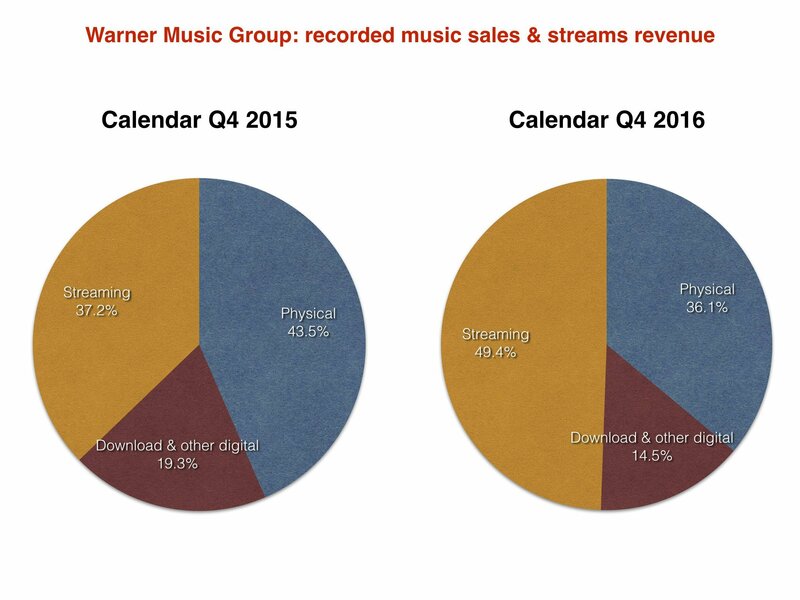 Warner’s recorded music operating income was $123m in the quarter – up from $98m in the equivalent period of the prior year. Operating margin grew to 15.4% versus 13.3% in the prior-year quarter. Warner’s publishing group, Warner/Chappell, racked up $124m in the three months to end of December, 2016. That was up 6.9% (or 10.7% at constant currency), with growth in digital and synchronization revenue partially offset by a decline in mechanical and a decline in performance revenue which WMG said was largely timing related. Warner/Chappell’s quarterly operating loss was $2m compared with a loss of $13m in the prior-year quarter. The improvement in operating income was due to revenue growth in the quarter and the absence of legal settlement costs which impacted the prior-year quarter. ‘Digital’ revenues at the publisher jumped 59% to $43m, but mechanical rights revenue dropped 20% to $16m. Performance revenues also fell 14% year-on-year in the quarter to $37m. Synch revenue rose 4% to $26m in the period. Across Warner Music Group as a whole – inclusive of publishing and records – revenue grew 8.0% (or 10.6% in constant currency) to $917m in the final quarter of calendar 2016 (Warner’s fiscal Q1). Growth in Recorded Music digital and artist services and expanded-rights revenue and Music Publishing digital and synchronization revenue was partially offset by declines in Recorded Music physical and licensing revenue and Music Publishing mechanical and performance revenue. Overall digital revenue grew 27.6% (or 30.2% in constant currency), and represented 48.4% of total revenue, compared to 41.0% in the prior-year quarter. Operating income was $94m compared to $62m in the prior-year quarter. Net income was $24 million compared to $28 million in the prior-year quarter and Adjusted net income was $28 million, flat with the prior-year quarter.